With Utah’s boundless enthusiasm for the outdoors, it’s a point of mountaineering pride that long-time Everest-scaling record holder Apa Sherpa moved from Nepal to settle in Draper several years ago with his wife, Yangjin, so that their three children could have better educational opportunities. 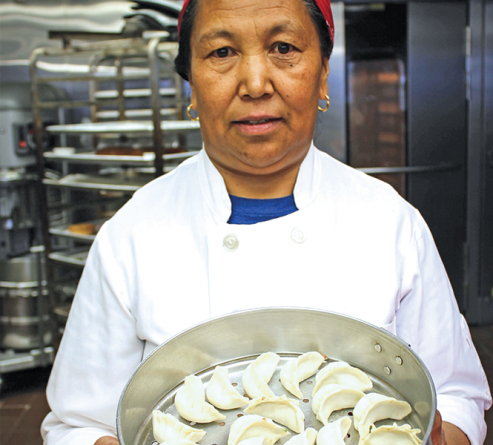 Fortunately for Utah foodies, Yangjin also brought her own wealth of knowledge and skills from the hospitality side of the Nepalese climbing tourism trade, having run the family’s famed Everest Summiters Lodge B&B and holding certifications in cooking and hotel management. Both Apa and Yangjin grew up in the mountain village of Thame (at 17,716 feet above sea level), a place famous for its skilled mountaineers known as sherpas, and they married in 1988. Running a home and business in the region was incredibly challenging, Yangjin says. The closest market is the Namche Bazaar, which is only open on Saturdays and is a full day’s walk from Thame; Yangjin then hired porters with yaks to deliver all of the market goods to the B&B. In 2009, they founded the Apa Sherpa Foundation (ApaSherpaFoundation.org), which supports schools in Nepal by funding teachers’ salaries, school resources and hot lunches for the children. “If there’s no tourists, there’s no money,” Yangjin says of the hardscrabble life in Thame Valley and Nepal. The foundation gives people the opportunity to survive and thrive. On very special days, Yangjin shares recipes from Nepal, which this writer was lucky to sample during a recent staff lunch. Embracing the flavors of the continent, Nepalese momos are the comforting combination of the curry-forward spices of an Indian samosa with the pillowy texture of a Chinese dumpling. As they’re time and labor-intensive, Yangjin says she only makes them as a special-occasion treat. 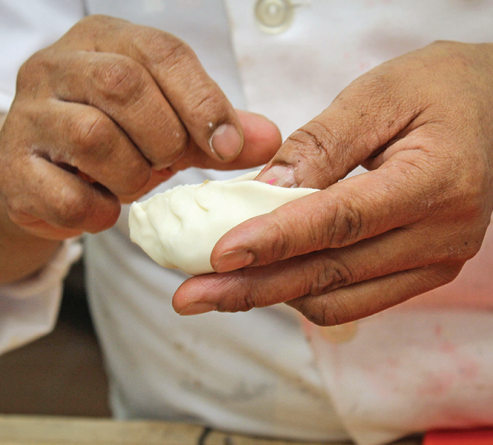 In Nepal, cooks use the technique of rolling out each individual momo wrapper by hand by pinching out small balls of dough. Yangjin now appreciates the convenience of using a stand mixer to prepare the dough and a pasta machine or sheeter to roll it out. If she’s in a hurry, she uses the shortcut of purchased commercial wonton or egg roll wrappers. “They are more fragile than handmade dough,” she warns of the substitution, “and they stick to the steamer and fall apart easily,” if not handled with care. A vegetarian, Yangjin also recommends replacing cooked mashed potatoes for ground meat with similarly delicious results. She enjoys cooking for her grown children (Tenjing, who studied at Utah Valley University; Pemba, who graduated from the University of Utah with a degree in civil engineering, and daughter Dawa, who just completed her nursing degree at Westminster College) and 3 ½ year old grand-daughter, but says that their home kitchen sees very little influence from her husband. “Apa only knows how to make tea and instant ramen. I do all the rest of the cooking,” Yangjin says of their arrangement. And everyone’s thrilled when she’s making momos. *Yangjin Sherpa’s custom blend of curry powder, “meat” seasoning masala, dried red chili flakes and salt, which is lightly toasted in a hot dry skillet before use. To make the wrappers: Mix the flour with salt and about 1 ¾ cups water, stir in a large bowl; add more water in 1-2 tablespoon increments and knead until all flour is absorbed and a stiff, uniform dough forms. Cover, and let rest for at least 30 minutes. Knead the dough a few turns before making wrappers. Use a pasta machine or rolling pin to roll out dough 1/8-inch thick and cut into rounds with a 3-inch cutter. 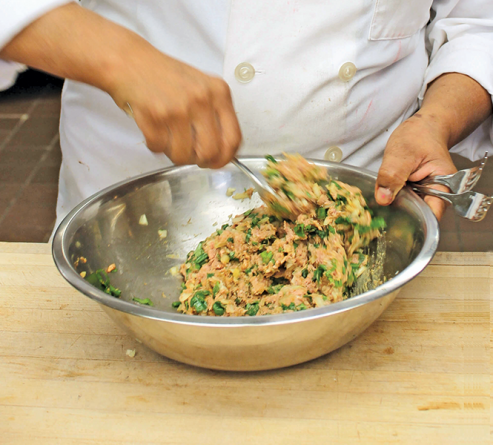 To make the filling: Combine all ingredients in a medium bowl; mix well with hands or a spoon. Cover and refrigerate until ready for use. To assemble the momos: Add one packed tablespoon filling to the center of a wrapper, gently folding dough in half to create a semi-circle. 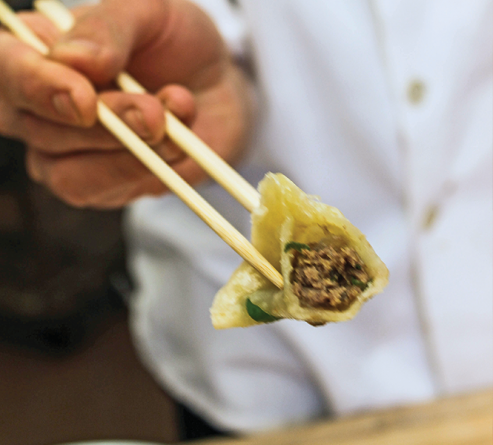 Starting at one side and moving to the other, seal the top of the momo by pinching the edges together and creating pleats, gently pushing air away from the dumpling filling as you go. Cover completed dumplings with a tea towel to prevent drying. 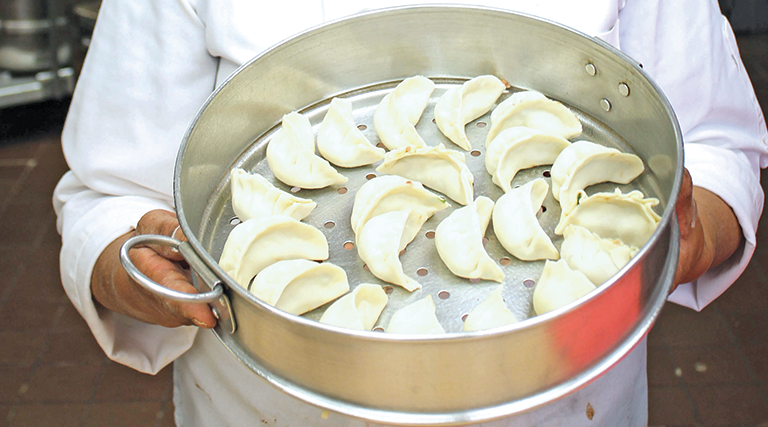 To cook the momos: Bring water to a low boil in the base of a large steaming pot. Liberally oil (or use non-stick spray) the steamer trays. Arrange uncooked momos in the steamer baskets leaving room between each dumpling to prevent sticking and ensure even cooking. Close the lid, and steam for about 15 minutes. While the momos are cooking, prepare the achar sauce: To a heavy medium saucepan over medium heat, add the chopped tomatoes, onion and garlic. When tomatoes have released their juices and are soft, add the spice mix a half-teaspoon or so at a time to taste. Remove from heat and pour into a blender (or use an immersion blender). Add the fresh cilantro. Make sure you cover the blender lid with a towel and hold firmly to avoid explosions! Using on-off pulses, blend until just combined. Serve everything while it’s still hot and steaming.